The addition of the device template library helps to streamline the device modeling workflow. It saves time as you can pre-populate a model with existing details. This now opens the door for more manufacturers to create standard definitions for their devices or smart products which we’ll continue to include in this growing template library. To get started with selecting a device template, select the Device Templates tab and click the “+ New” button. This will bring you to our library page where you can choose which template you’d like to get quickly started with. You can also choose the Custom option if you would like to begin modeling your device template from scratch. Once you select a template, simply give it a name and click “Create” to add this template into your application. We will automatically create a simulated device for you to view simulated data coming into this new template. 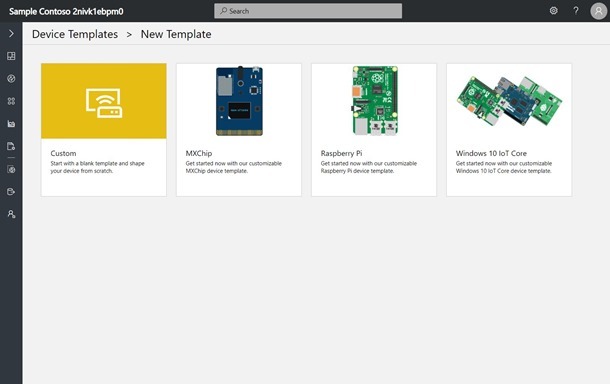 Once your template has been created, you can visit the “Device Explorer” page to connect other real or simulated devices into this template. We are excited to continue simplifying your device onboarding experience. If there are particular device templates you want to use or if you have any other suggestions, please leave us feedback with the links below.